As Carol Christ, our fearless leader, explained to us that first night in Crete, a pilgrimage is more than just a journey to a sacred place, it is a journey between states -- physical, mental, emotional and spiritual. In a way, when you are on a pilgrimage you are without a country. In starting a pilgrimage, you cross a threshold into a liminal state, where you often experience a sense of timelessness, if not another place in time. Pilgrims are on their own personal odyssey as well as on a collective odyssey with other seekers. 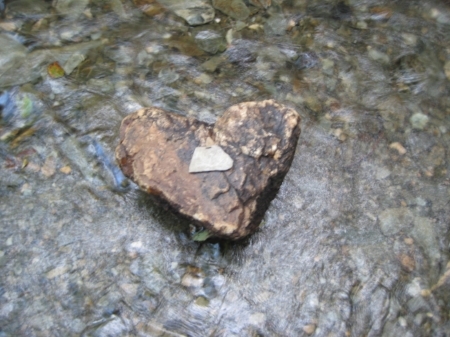 In their book, The Archetype of Pilgrimage: Outer Action with Inner Meaning, Wallace and Jean Clift describe the various reasons for embarking on a pilgrimage: to answer a call to adventure (one of the first stages Joseph Campbell described in "The Hero's Journey"); to experience a place of power; to hope and ask for healing or a miracle; to express a love of God (or Goddess); to find or reclaim lost pieces of ourselves; to give thanks; to ask for forgiveness; to leave the routine of ordinary life and experience something new or numinous; and to prepare for death. On this last point, it would seem we are always preparing for death, albeit often unconsciously, and going on a pilgrimage can feel like one of those things you need to do before you die. In many respects, all of these reasons compelled me to go on Carol Christ's Goddess Pilgrimage, a 2-week sojourn she has been leading in the spring and fall for 20 years. The night before we left Athens for Crete, I put on some music (Gabrielle Roth's CD, Luna) and danced on the rooftop of our hotel, where I had a stunning view of the Acropolis, awash in golden light. I was celebrating the initiation I had experienced at Delphi and preparing myself for our morning sight-seeing at the Acropolis, afternoon releasing ceremony at Eleusis, and evening flight to Crete the following day. Dancing in the moonlight I felt the energy of the priestess. I was integrating the mysteries I had already experienced and initiating myself for those to come. The next night, we landed in Crete and met our sister travelers on the rooftop of our hotel in Heraklion under a full moon. There were 20 of us, including Carol and two sets of mother and daughter travelers. I knew my mother was a part of this journey in spirit, and felt her presence strongly at times as I continued to both grieve and celebrate our life together. My sister pilgrims and I shared a little about ourselves and why we were there, starting with the affirmation, which would become a familiar refrain, "I am whole, I am here, I am... " and say our name. "I am whole, I am here, I am Stephanie." And so began the pilgrimage on the beautiful island of Crete, where the ancient, yet advanced, Minoan civilization honored the goddess of earth, sea and sky. The first stop was the palace or sacred center of Knossos, built around 2,000 BCE on sacred grounds where people had lived and worshipped since Neolithic times (6,000 BCE and before). 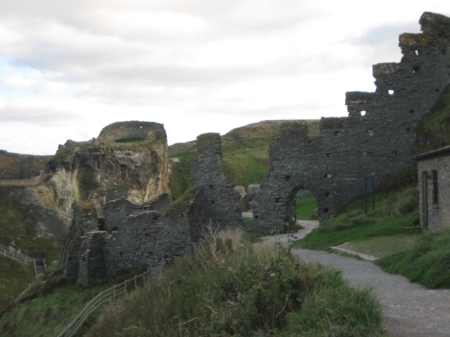 We silently walked in procession through these ruins, some of which were partially reconstructed by the archeologist, Arthur Evans, in the early 1900s. This was where the snake goddesses, which I was thrilled to see in the Heraklion Museum, were found. The palace of Knossos is where the King-Priest Minos and Queen-Priestess Pasiphae were thought to have lived, as well as the half-man/half-beast minotaur, in the center of the labyrinth. Some surmise that the myth of Theseus slaying the minotaur with the help of the princess/goddess, Ariadne, whom he later abandoned, represents the end of the worship of the goddess and the beginning of the patriarchy on Crete and throughout Greece, as Theseus was a warrior king from Athens. What was most likely enacted here before the patriarchy was the hieros gamos, or sacred marriage between the priest and priestess who wore masks of the bull and cow, representing the joining of the sacred masculine and the sacred feminine, or the sun and the moon. This celebratory pageant, attended by all members of the community, included the connubium, or consummation rite, and ended with the coronation of the king and queen in the center of the labyrinth. The mural depicting the "ladies of the court" were likely priestesses, dancers who led the procession and circled around the royal couple. The bull was sacrificed as part of the marriage feast to ensure fertility across the land. These rites were once widely celebrated at the sacred centers of the Minoans, for they were an egalitarian society in which the goddess was honored as the ubiquitous, life-giving force that She was. We were to visit many other sacred centers of Minoan culture throughout the two week pilgrimage. We would weave in and out of the stone passageways and crumbled foundations, imagining what it would have been like to live in these village centers where the people practiced sacred rituals as part of their everyday life. Virtually all of these sites had stone altars, many in the form of kernos stones, giant table-like slabs, with bowls carved into them for the placement of offerings. Many of these sites had lustral baths, large cisterns or small rooms filled with water in which people passed and cleansed themselves before taking part in sacred ceremonies. There were storerooms with giant pithos jars that were used to hold the olive oil and wine. Many of these centers were built over and over again after maurauding invaders set fire to them or earthquakes ravaged them. At times, we would feel the veil was thin between present time and days of yore, and we could feel, if not hear, the priestesses dancing and singing or sense the panicked state of those who fled from impending danger. This introduction to Minoan culture was followed by a much anticipated visit to the Paliani Convent, an old convent (from about 668 CE) and the sacred myrtle tree that is said to be over 1000 years old. Sue Monk Kidd described her visit there (while she was on Carol's pilgrimage) in her book, Traveling With Pomegranates, and the granting of her wish to write a novel after being a non-fiction writer for many years. The Secret Life of Bees, which featured the black Madonna as a prominent character, would be her first book of fiction. I looked forward to visiting this sacred tree as I have always loved the spirit of trees, and this one was magnificent. The story goes that after the Turkish invasion in 1821, the convent was destroyed, but an icon of the Virgin Mary was found in the tree. The nuns moved it into the church, but the next day it was found back in the tree. As many times as they tried to take it in, She made her way back to the Tree of Life. And so she has remained there, now entirely encompassed by the arms of the great tree (a smaller replica hangs on the branches for all to see). Here, we said prayers, asked for healing, and tied a ribbon on the tree in remembrance. We each took a small piece of the myrtle tree from fallen twigs, wrapped the same color ribbon around it, and brought it home with us. One member of our group shared that she had experienced an instantaneous healing of a problem she had been having for months. The nuns who lived there were sweet and welcoming, and we felt Mary's presence. The highlights of the pilgrimage for me were the rituals we performed at altars we created in various settings, from a Tholos, or rock tomb on the top of a hill, where we all took part in a ritual to honor our ancestors, to ones we performed in some of the caves we visited, which very much felt like being in the womb of the Great Mother, to those we built on mountaintops with panoramic views of Crete and the surrounding seas. We each bought a Minoan snake goddess to represent us on the altars. We would bring liquids for libations to pour onto them, including clear spring water, wine, and honey, as well as seeds, stones and talismans we wanted to bless. 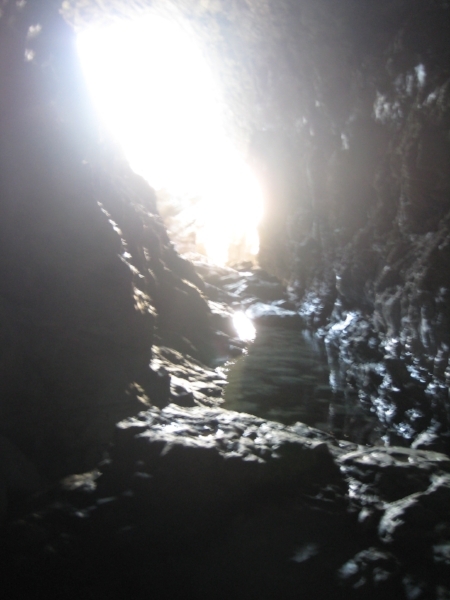 Our arduous climb down into the depths of the first cave, Skoteino, which means "dark," was a profound experience for me. As we entered the cave, I heard a fluttering of wings and a white dove, symbol of Aphrodite, flew out. She is an ancient mother goddess I have felt a strong connection to so I felt this was a sign of her presence. We created a beautiful altar and releasing ceremony, where I was able to not only let go of the hurt between my mother and me, but lifetimes of pain in my motherline that freed us all. We then descended two more levels and ten of us made our way down into Her womb. There we extinguished our lights and sat in complete darkness, meditating. I felt such peace and connection to the divine as I sat upon the moist, red Mother Earth and envisioned being held in her great lap. In each of the five caves we visited we sang songs to Her, the walls reverberating with the sound of twenty women's voices, as if we were in a cathedral. And, so we were -- the cathedral of the divine feminine. In these two intense weeks of travel, we got to experience the beauty of Crete, from beaches to mountains, caves, gorges, lakes, and plains. We sang songs to the goddess on the bus as we zig-zagged across Crete. We rode donkeys to the cave of Zeus. We sat in the roots of a 2,000 year old tree that all 20 of us together could just wrap our arms around. We wandered the streets of many a town in search of treasures and adventure. We got to know the people who lived there, simply but happily close to the earth and her bounty, and those who ran small inns and tavernas. We feasted on many gorgeous meals of fresh vegetables, fruits, the most delicious homemade yogurt, feta, bread, local honey, and olives of every variety that most taverna owners harvested from their own orchards after the tourist season ended. And always the raki, the distilled wine aperitif that was served with every meal. Yamas! It was always a treat to pluck a ripe pomegranate from the trees that flourished there. We met women who were hand crafters in the old tradition of weaving on looms, creating intricate embroidery, and lace-making. We learned of the hidden motifs of the goddess, the tree of life, the snake, and other symbols of the feminine divine that have been woven into fabrics and piece-work for centuries. While Greece is very much a patriarchal country, which was evident in the roles we saw played out, archetypes of the goddess are still evident in many weavings. We danced traditional Balkan and Greek dances under the leadership of Laura Shannon, who leads women's ritual dances around the world and whom we were privileged to have with us. We savored our days off in beautiful locales like the small mountain resort, Zaros, the picturesque fishing village of Mochlos (I want to go back to both of those dreamy places one day) and the small coastal city, Agios Nikolaos, where I behld the goddess in the sunrise. The weather was warm and clear as was the sea we swam in more days than not. There is nothing like eating and drinking at a seaside taverna and then plunging into the warm waters that lap at the shore. At Mochlos, we could swim to a small island and explore the ruins of a sacred center of the Minoan culture that was once attached to the land. This pilgrimage to the goddess of ancient Minoan culture was a journey that has continued to play out in my dreams and memories. It all started with a dream I had last year of standing on a Grecian cliff and noticing some undiscovered temple stones beneath my feet and realizing that I had found one of Aphrodite's forgotten temples by the sea. To me, this symbolizes the rising of the goddess and the shift of consciousness that is slowly taking place that will include once again an embrace of the divine feminine. For all of us who shared this pilgrimage we truly came to know She is there for all who seek Her. Be sure and read Parts 1 and 2 and the conclusion of my journey to magical Santorini in Part 4. In my Goddess Temple e-course to meet the Alchemical Goddesses, you take a similar journey as Psyche, the woman who became a goddess. If you want to know Who is Psyche? you can read about her here. I am fascinated by this story because there are so many ways to understand it. One way to look at Psyche’s journey is the one presented by Jungian analyst Robert Johnson in his book, She, as symbolic of feminine psychology, the way we women tend to operate and face challenges as distinct from masculine psychology (which he defines in the book, He). Another way is to look at Psyche’s journey as symbolic of the creative process. Each time we take on a creative project or endeavor, whether it’s starting a business, writing a story, committing paintbrush to canvas, starting a new course of study, or any number of ways we enter the creative realm, we are faced with obstacles and challenges, fears and doubts, breakthroughs, growth, and jubilation. The first obstacle might be characterized as the terror of beginning. It often feels overwhelming to look at the journey ahead and all that we need to accomplish to bring our creation to fruition when we are at the starting point. Where and how do we begin? The blank canvas, the blank page -- facing the unknown -- can be daunting. The first of Psyche’s tasks is sorting a huge pile of seeds. The task of sorting is a good way into the creative process. Whether it’s words on a page that have to be organized, paint colors and media that have to be decided on, classes that have to be selected, or choosing the steps needed to make a business a success, we are needing to sort through ideas, words, concepts, materials. Sometimes we need to organize our office or studio and clear out the clutter, and as we do so, sort through the wheat and the chaff in our head, before we feel prepared to embark on the creative journey. A jumble of words and ideas will need to be sorted into coherent sentences, some edited out. The colors and image chosen for a painting may get painted over as a new image and colors emerge that we like better. So many decisions need to be made as we start the process of bringing our creations to life, decisions that may be changed a hundred times as we sort through what matters most. Psyche’s seed-sorting task speaks to this aspect of beginning the creative process. It is a winnowing of ideas, of discerning what’s important and vital to our vision, and what’s not. Psyche despairs about doing this seemingly impossible task, but she is able to do it with the help of the ants. Ants represent patience, taking one step at a time, moving one kernel at a time, until the job gets done. So as we begin to create, it’s important to step into the mess or chaos of not knowing and begin with one thing. And then another, and another, whittling away until the vision starts to take form and we’re in it! The second task Psyche has to accomplish is to obtain a bit of golden fleece from a fierce and potentially deadly ram in a field. She can’t see how to do this and almost gives up in despair until she hears the reeds whisper to her a way. All she has to do is wait for the right time, when the rams are on the other side of the field, and pluck some fleece from the bushes! That’s like one of those moments when you say to yourself, “Why didn’t I think of that? Of course!” This is when we discover that there is an easier way to do something than we had thought or than we have been doing. And we start to do it that way now because we have learned a more efficient and clever way to do something, but we had to do it a different way or sit with the dilemma for a while first. This often happens in the creative process when we’re stuck. We’re frustrated and don’t know how we’re going to proceed or how to solve a problem and we may think about giving up because it’s just too hard! This is when we need to pause, wait, and listen. Just when Psyche was about to give up, the inner voice whispered an answer. If we can learn to wait for it and listen, many times we will find the solution. Sometimes we need to sit on something, sleep on it, or otherwise take a break and come back to it with new eyes. By biding her time, Psyche was able to get the prize in a way that did not require that much effort. We forget sometimes that the easiest way may be the best way. We may realize that we’re making something harder than it needs to be. This is the lesson of the second task: Stopping to see what our choices are and letting the answer come to us. If we can hang in there and not give up, and stay open and ready to receive, the answer invariably arrives. It may come from our own inner knowing, from a dream, or it may come from an outside source, a synchronistic event. This is a matter of trust. The third task involved Psyche being sent to the River Styx, the boundary between the Earth and the Underworld, where dead souls pass over, and which is guarded by all manner of monsters and beasts. She is to fill a goblet with water from the dark river and bring it to Aphrodite. Again, Psyche is ready to give up, knowing that she cannot approach the river under these circumstances. She is helped by an eagle, who carries the cup to the water, fills it, and brings it back to her. The eagle was summoned by Eros who asked Zeus to intercede and send the eagle. This points to the need for helpers, support, and the ability to gain perspective. There comes a time in most creative endeavors when we must ask for help, feedback, or support. Again, we may be trying to do things the hard way, all alone, and feel that we are working in a vacuum. Like the eagle, we need to be able to fly overhead and look down on our situation and ask: What help do I need? Who or what can assist me and help me overcome these obstacles and accomplish my goal? We also want to be careful of the trap of stubbornly insisting upon doing things our way, on our own, with no help. The creative process needs to be fluid and active, like the river, and we need to consider all of our resources and tools and not be closed to outside help, however it may come. The intervention of the masculine forces in the myth, suggests marshaling that part of our psyche that can logically figure out what needs to be done, swoop in, and do it without letting fear stop us. The feminine is the allowing, receiving, and being open to intuitive wisdom and guidance. The gift of overview, the eagle eye, can help us see what needs to be done more clearly. The fourth task Psyche is faced with is to go down into the Underworld and obtain a box of beauty from Persephone, who rules there. She is not supposed to open the box, but we already know Psyche is a curious woman, who couldn’t resist looking upon the face of her lover. So, of course, like most of us would be inclined to do, she peeked into the box. And then something came over her that caused her to fall into a deep sleep and near-death. Fortunately, Eros (again, the masculine part of our own psyche that knows when it’s time to act) flew in and revived her. We could see this as Psyche being a bit too passive, overwhlemed and immobilized by ideas and things to be done, not to mention the myriad obstacles before her, that she can’t quite get up the motivation and energy to meet the task and complete it. She gets off-course by looking into the box even though she has been advised not to. This symbolizes the things that distract us and pull us off our path, procrastination, or things that we know are destructive to our creative process, but we do them anyway in an unconscious act of self-sabotage. It is often at the end point or near the end of a creative project, that we want to give up and are tempted to abandon it, leaving it by the wayside, incomplete and unfinished. It is the masculine component of our psyche that helps us to wake up, activate, organize, and get the job done. We may need to step back and reconnoiter, and call in our inner warrior to help us move past these last barriers to accomplishing our dreams. Thus reunited and joined as Psyche and Eros in divine union, we reach the pinnacle of the creative process when our inner feminine (thoughts, ideas, imagination, inspiration) and masculine (acting, doing, accomplishing, manifesting) are working together harmoniously and are able to give birth to new life. The wedding of Psyche and Eros represents living out our creative potential and the divine child they give birth to is our own creative dream brought to life. Virtually no other goddess brings to mind the feminine qualities of love and beauty like Aphrodite. She is a Greek goddess who is actually a later incarnation of the Great Mother, goddess of fertility, and all that is. She is an archetype harkening back to Neolithic times and beyond. 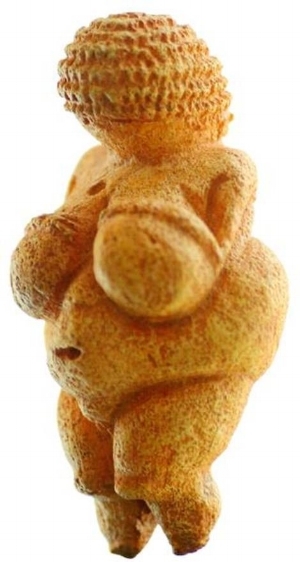 All of the little rounded mother goddess figures that are dug up in Europe and Asia are called Venuses, such as the Venus of Willendorf, the Venus of Lespugue, Venus of Dolni, etc. That is because they all represent this most ancient form of the sacred feminine, the Great Goddess. Venus is her more modern Roman counterpart, but does not hold the deep connection to love for earth and all its creatures, the association with the full moon and fertility, that the Great Mother does. The word “Aphrodite” means born from the sea foam, the ocean, or womb of the Great Mother. She is said to have come ashore near the island of Cyprus. Some say Aphrodite came from the stars, but her myth always describes her as rising out of the ocean or stepping foot onto land from the sea. And in this way we can see how she might be seen to give birth to herself, just as we can give birth to ourselves by seeing ourselves in a new way. 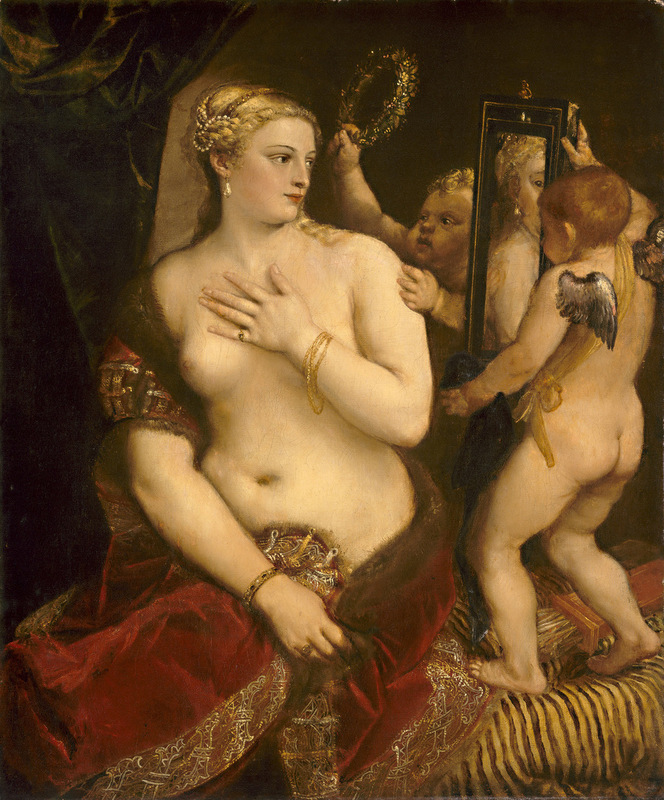 There are several artist images showing her looking into the mirror. This underlines the theme of the goddess reflecting ourselves. As we see the goddess of love and beauty in the form of Aphrodite, we see our own love and beauty and all its possibilities reflected back to us. We must learn to love ourselves. We must learn to accept our messy lives, our mistakes, our bumps and lumps, our doubts and fears, so that we can transform them with love. Aphrodite is said to be an alchemical goddess, due to her abilities to change us from the inside out. When we can love our own imperfections, we can love another’s, bringing about more tolerance and acceptance, important ingredients in the alchemy of love. When we stop judging ourselves, we will stop judging others. When we no longer feel the need to criticize ourselves, we will no longer feel the need to criticize others. Aphrodite shows us the way by allowing us to see that every form of beauty has its flaws and that perfection is an illusion, a soul-killing exercise in futility. If we accept, even love our flaws, our quirks, our “perfect imperfections,” we redefine beauty by including ourselves, our humanness, in the definition. So we must learn radical self-care. We must learn to love ourselves first for only then are we able to love another wholly and completely. That doesn’t mean we become selfish narcissists. It means we start with us. When we fill ourselves with love, it overflows onto others. Too many of us as women walk around empty, depleted, always giving, giving, giving to others, and forgetting to give to ourselves. We’ve forgotten to fill the well. And we must start with feeling deserving. That’s where Aphrodite comes in. While there are many ways to look at Aphrodite as an archetype, I choose to see her as a Great Mother goddess, who can help us learn to love ourselves, to see our own beauty, and to take better care of ourselves. Every good mother believes her child deserves love. Aphrodite sure believed she deserved to have love and pleasure and she saw to it that others did, too. We need to make a practice of this. That is why I created a new chapter on Aphrodite: to provide suggestions and ideas for bringing out more of our sensual nature, to find ourselves through creativity, to learn to engage with life more, and ultimately to love and care for ourselves. In Celtic tradition, February 2, Imbolc or Candlemas is celebrated. This is the time when Brigid or Bride, makes her presence known. She is goddess of the fire; Imbas was the word that described inspiration that came from her creative and transformational fire. Imbolc refers to the time when the ewes are lactating in preparation to give birth to their lambs in spring, just six weeks away. it is a time for the maiden Brigid to bring in the light so as to usher the old crone of winter out and let the sunshine in. Brigid's triple aspect is as goddess of poetry, smithing, and healing. The fire is important to each of these crafts. The poet receives enlightenment and passion from the fire, and the stories and poems told by the bards were like fire themselves, unable to be harnessed, touched or held. They could only be passed from mouth to ear in a sacred way by those who were skilled in the art of storytelling. Both the white-hot fire of the blacksmith that shapes lumps of metal into useful objects, as well as the healing fire of the hearth that boils the herbs and potions, bring about transmutation. And so it is with each of us as we honor Brigid's fiery presence. She has the power to enlighten us. When Christianity usurped the worship of the goddess, St. Brigid was born in the fifth century CE, with many of the same attributes as the beloved goddess of yore. St. Brigid was born at sunrise just as her mother crossed the threshold of her home, associating her with the idea of liminality--existing between worlds. There were many legends about St. Brigid's connection to fire, like the goddess of her namesake. One such is that when she was an infant, she was left in the house while her mother tended the animals. Neighbors saw great flames of fire engulfing the roof of her house and rushed to her. But when they reached her, there were no flames or burnt remains. She was said to perform miracles, like the magical goddess herself, healing the afflicted, bringing stillborn babes to life, and having a never-depleted cauldron of food for those who were hungry. St. Brigid's fire is still tended by 19 nuns in Kildare, Ireland and never allowed to go out. Tonight I gather with a group of women who celebrate these sabbats as the Great Wheel turns, and we will all light candles from one that was lit from Brigid's sacred flame in Kildare. I invite you to light a candle in honor of the returning sun, the bright goddess, and the passions that stir within each of us. I am Cerridwyn, daughter of Wales. I live alone on an island in the middle of Llyn Tegid (now Bala Lake). Some call me a hag witch, which I consider a compliment for they are only acknowledging my powers as a holy woman, a fierce healer. I have two children, a daughter, Creidwy, and a son, Morfran, who I would fight to the death to protect from harm's way. And that is what I do for you, my children, protect and guide you through the dark nights of winter. For this is a time to be brewing new potions in your cauldron for the coming year. It is time now to sit by the hearth fire and stir the thick soup, letting it simmer over the long dark nights to come. Don't be afraid to add new ingredients, to play with the recipe. I encourage you to add generous dollops of Courage, magnums of Inspiration, and heaping cupfuls of Trust. Circle the cauldron throughout the winter months, remembering its power, touching the container of life, death and rebirth, the never ending cycle, the beginning and the end. Seek the light in the pregnant darkness. Gestate. Care for yourself. Renew. Restore. Release. And do it now my children, on December 22, the longest night of the year, when the sun appears to stand still in the sky. It is the time to release all that has been accumulating and weighing you down so that you can make way for the new. I invite you to follow the lead of my sister, Pixie Campbell, as she guides you in the Mother of All Releasings Ceremony: Winter Solstice, 2012. Shed away your tired old coats my darlings. Shed the tears that tear you from within. Like a snake who has outgrown her skin, writhe and scrape until the dull old scales fall away. Slough off the remnants of your worn-out self. Peel away the layers that no longer suit you, that constrict you, so a shiny, smooth, lissome you emerges. Glide effortlessly into the new year adaptable, flexible, amenable, joyful. Enter your new beginning with grace, warm, bright, glistening, grace. On this Taurus full moon, with the pulsing energy of 11/11/11, a time of wish-fulfillment upon us, the goddess Lakshmi asks us to check in with our self-worth and to own our power as creative women deserving of abundance. Lakshmi is the Shakti or activating female goddess counterpart of Vishnu, the preserver of all life. She is much like the Greek goddess Aphrodite; both are seen as ancient Mother Goddesses who are said to have been born from the ocean, the Great Mother's womb. They are goddesses of love, beauty, fertility, and abundance. Taurus is governed by Venus, the planet named for the Roman goddess of love and beauty. A Taurus full moon helps us bring into being that which we have been longing for and to get our needs met in ways that are self-fulfilling and rewarding to us. Lakshmi wants us to know our self-worth and act from this place of personal power. When doubt and fear creep in, Lakshmi can help us transform these shadowy energies into confidence and love, and create a bountiful harvest. Lakshmi reminds us of our wealth, both on a soul level and on the earthly plane. She reminds us that the Universe is abundant and plentiful. We have all we need and more. If we're feeling needy and lacking, where is this idea coming from? What old story are we telling ourselves that may need to change so that we can embrace the life-giving, loving, sustaining energy of the Goddess Lakshmi? Lakshmi stands on a lotus, a symbol of spiritual enlightenment and beauty. By seeing and embracing our own inner beauty and the beauty that surrounds us, we allow our perception to create our reality. This is our secret power, simple but profound. As we change the way we see things, our reality shifts and reflects how we think about ourselves and the world. I am whatever is. Whatever is, I am. I am whatever is visible. Whatever is visible, I am. I am whatever is invisible. Whatever is invisible, I am. I am whatever is alive. Whatever is alive, I am. I am whatever moves and breathes. Whatever moves and breathes, I am. I am the very spirit of life. The very spirit of life, I am. Everything that exists in time is part of me. I am everything that exists. When time ends, I will end. I will vanish, disappear, dissolve. And with me, everything else will vanish, disappear, dissolve. I alone can create, and I alone destroy, this universe. Everything that exists is mine. Everything that exists is me. What is it I want to manifest? What is my plan to fulfill it? How am I living or not living in abundance? How might I be giving my power away? How can I own my power and manifest my dreams? What am I willing to let go of that may be in the way of making this happen? What do I need to add to my life or change to make this transformation complete? How can I better love myself? How can I better love others? If you see an old woman walking down the road one dark moonless night, take heed, because that may be the "Distant One" who has words of wisdom for you. Be kind to the woman who stands at the crossroads for that is said to be the threshold to the underworld, the realm of Hecate and the maiden-turned-queen, Persephone. And if you come upon such a crossroads, leave an offering for Hecate's supper. If you honor her, she will honor you by showing up whenever you need help, whenever you stand at a crossroads and need to make an important decision, a choice about which direction to take. She is the one who will stand beside you and help you summon the courage to step into your power, to listen to that inner voice that knows what is the right decision for you in that moment. She is the one who will help you hear the answers that your ancestors have to give you if you will but ask and listen. She is the one who protects you in remote places, when you have lost your bearings, when you feel trapped, hemmed in, without a safety net. She is the one who is the Dark Mother, who will hold you in the blackness until the first streams of light illuminate your path. She is the one who midwifes you through your own birth, death, and rebirth and who helps lost souls pass over. She embodies the three faces of the goddess: maiden, mother and crone. Sometimes she is depicted as having three animal heads: lion, snake and dog or at other times the dog, horse, and bear. She travels with three black hounds or some say the three-headed dog, Cerebrus. She stands at the crossroads where three roads meet. From there, she can see into the dimensions of past, present and future. She is the moon in its three phases of waxing, waning, and full. She walks between the three realms of earth, sky, and the underworld, where she presides over the passages of birth, life, and death or of birth, death and rebirth, a reflection of the moon's phases. She represents the three stages of the mysteries of agriculture: the green corn (Kore, the young maiden), the ripe ear (Persephone, the queen) and the harvested corn, symbolized by Hecate, herself. She is a goddess of magic and transformation and carries three sacred objects: a key, a rope and a dagger. Use these symbols to help you unlock the wisdom of the ancient mysteries. The key is the way into the underworld, where we must go to transmute fear into love and bring unconscious stirrings into the conscious light of day. The rope is the umbilical cord that when cut allows us to experience rebirth, renewal and enter a new cycle. The dagger, like Kali's sword, cuts through the illusion of control and duality and allows us to see things in greater dimension, no longer in black and white, either/or possibilities. She helps us give up control when its needed to allow magical transformation to occur. Hecate represents our medial nature, our ability to see beyond the ordinary, and thus she can help bring magic and mystery into our lives. Hecate, daughter of Nyx or Ancient Night, is with us now, during the dark, new moon and especially on Samhain, October 31. It is on October 31 that the veil between the worlds is said to be most transparent, and a good time to converse with the ancestors, leave offerings, and discard what no longer serves us into the fire. What do you need to release? Halloween is a good night to name it and cast it into the fire. Hecate stirs the cauldron of creativity. What is brewing in your cauldron tonight? The new moon is a good time to start a new project or claim a path you want to take and step onto the road with Hecate at your side. I am the Darkness behind and beneath the shadows. I am the absence of air at the bottom of every breath. I am the Ending before Life begins again, the Decay that fertilizes the Living. I am the Bottomless Pit, the never-ending struggle to reclaim that which is denied. I am the Glory of Discovery, for I am that which is hidden, secluded and forbidden. One of the very earliest manifestations of the Dark Goddess was the Minoan Snake Goddess, who reigned during the 16th century BCE. She holds two snakes aloft, symbolic of the dual nature we see on earth: masculine and feminine, light and dark, life and death. The goddess acts as the fulcrum, the one who holds both in balance. The netlike pattern on her skirt reminds us that She is the weaver of life, her womb the center of the web. The seven layers correspond to the number of days in each of the moon's four quarters. Sitting in the lap of the goddess invites one to experience the matrix of time and eternal transformation. The Aries full moon on October 11 and the Scorpio new moon on October 26 provide a portal to walk through the door and meet the Dark Mother. This is her season, the time when the veil between the worlds starts to dissipate, culminating on the Celtic cross-quarter day, Samhain, or Halloween, on October 31, when the veil is thinnest. The full moon initiates us on the Quest, the journey to find our True Self, and the creative and artistic expression that is our Soul's purpose. It is time for the Kundalini serpent power that lies coiled at the base of the spine to awaken and move up through the chakras into its full power. This feminine life force has been recognized and celebrated since ancient times. It allows us to reconcile the dark and the light, the positive and the negative, to let go of that which no longer serves us and to transform. The Dark Goddess helps us see in the darkness of our own being, that which lies beneath the surface, wanting to be seen, heard, known, born. It has but to be cultivated so it can reach up through the rich soil of the unconscious towards the light. We can help it by looking inward now and sitting with the feelings that are percolating, shining light on them, and tending them. If it is fear, we can observe it and wrap it in a blanket of security and safety, transforming it into love. If it is hurt and pain, we can cry and release it and hold it in our arms, nurturing and calming it, allowing it to turn into understanding and peace. If it is anger and negativity, we can allow it to speak and be heard and then release it, changing it into gratitude, acceptance, and serenity. But, first we must acknowledge these dark places, illuminate them, and then work with them to bring them into a higher state of consciousness and integration. For they are all parts of the shadow that must be seen and taken care of, for they will get our attention one way or the other. Like the snake that sheds its skin, we can release the old, shadowy parts and claim our new skin. Ancient people used to think that the snake died when it shed its old skin and was reborn with its new skin. The Greek word for the snake's cast off skin is "geras" meaning "old age." After shedding the skin, one was reborn, and made new again. Snakes were seen as magical beings and were associated with the mother goddess as symbols of transformation. But once the patriarchal religions supplanted the worship of the goddess, snakes, along with women, were vilified and seen as the source of evil, seduction, and temptation. Since Eve listened to the Serpent who guarded the Tree of Life and ate the apple as the snake implored her to, women have been blamed for the fall of man. However, Eve's biting into the apple was what allowed us to enter into consciousness, and it is a role that women continue to play in the world. It is the feminine that shines the light, and brings consciousness to relationship. As we begin to enter the cycle of the dark half of the Wheel, Autumn and Winter, it is time to shine our light and do the healing work that starts with each one of us. Healing ourselves we do our part to heal the world. There are a number of pages in my workbook, In the Lap of the Goddess: Connecting With the Divine Feminine, which are devoted to this deep, soul work and transforming negative emotions into positive ones. I would love to gift you with my 57-page self-care manual so that you can work with the five goddesses that make up the chapters. Please leave a comment here about what you would like to transform and I will randomly select a winner on October 26 and send the book to your door. The full Harvest Moon on Monday marks the time when farmers bring in the last of the summer crops, the late harvest of root vegetables and cruciferous plants that will warm our blood over the colder months to come. The weather is starting to change, the sky to darken, foreshadowing the turning of the Great Wheel towards fall. We celebrate the autumn equinox on Friday, September 23. There's something in the air. Do you feel it? The stirrings of the Wild Woman, the dark goddess who arrives on owl's wings, silently gliding through the forest to awaken us? Do you hear it? The yip of the coyote, the howl of the wolf, the yowl of the cat, as they pad stealthily through the underbrush in search of sustenance? As September wanes, what does your inner Wild Woman want? Before we start to draw inward, there's still time to dance under the light of the moon, to stir something up in the creative cauldron. What is your passion? Art? Writing? Dancing? Singing? Cooking? Teaching? Nurturing? Healing? If you don't know, it's time to listen to your inner voice, to the Wise Woman within, to The One Who Knows. You know the story of Baba Yaga, don't you? It all starts with a little girl named Vasalisa, who much like Cinderella, must live under the watch of a horribly jealous stepmother and two mean, ugly stepsisters after her mother dies. But on her deathbed, Vasalisa's mother gave her a little doll, dressed just like Vasalisa. She tells her to keep it in her pocket at all times and to ask her for help whenever she needs it. So, as in all such stories, Vasalisa is sent out into the forest, into the dark unknown, where the old woman, Baba Yaga lives. Her mission is to fetch an ember from the Yaga as her stepmother and sisters secretly conspired to let the fire burn out. Everyone knows Baba Yaga is an ugly old witch, a frightening hag who flies about in the dead of night in a cauldron with a pestle as an oar. It's well known that she eats children for breakfast and uses their bones for toothpicks. Oh, and did you know her house dances around on chicken feet? Go on, little girl, there's nothing to be afraid of. And so the brave, little Vasalisa ventures into the deep, dark woods, just as we all must step into the darkness at times and face our worst fears. What are they? Not be liked or approved of? Or perhaps that you won't live up to others' expectations? But at each twist and turn of the path, Vasalisa consults the doll in her pocket and is advised which way to go, until at last she arrives at the crazy house that careens about on chicken feet. Vasalisa sees the fire for which she has been sent inside of a skull perched on a fence post. As she starts to reach for it, the unmistakable cackle of Baba Yaga causes her to pull her hand back in fright. Baba Yaga demands to know why she should give her the fire. "Because I ask," Vasalisa replies. That is the right answer, Baba Yaga tells her. Why? Because we cannot get the help we need unless we ask. Baba Yaga tells her she will give her the fire if she will complete the tasks she sets for her, seemingly impossible ones. She must cook three meals and clean her entire filthy house during the night, which Vasalisa is able to do with the help of the little doll. The next night she must sort thousands of seeds from the dirt so that Baba Yaga will have oil the next day. This she is again able to do with the help of the little doll in her pocket guiding her. Satisfied, Baba Yaga gives the skull with the burning ember inside to Vasalisa. She carries it home trumphantly, much to the surprise of the evil stepmother and sisters who thought they had seen the last of her. And, as is often the case with evildoers such as they, the fire consumes them, and leaves nothing behind but a few charred bones. And so it is with Baba Yaga, the witch, the crone, the hag -- for hag comes from the word, haggia, meaning holy wisdom -- the wise, old woman who teaches us. Her words are sometimes harsh, her demeanor frightening, her lessons hard. But as the dark goddess, the dark mother, she helps us burn up our fears and transform from frightened little girls into women of courage, women who are willing to take the necessary risks to reap the rewards of consciousness and creativity, to fuel the fires of our passions. And so, the Wild Woman learns to listen to her inner voice, follow her intuition, and dance by the light of the moon. Are you ready?